As we wrap up the Summer season we wanted to give you a quick update of all the things we’ve rolled out over the past few months here at Freightview. A lot of these things have already been covered in the blog, but we wanted to provide a quick recap. Have you ever wished you could put your own company logo on your Freightview BOL, labels and shared shipment emails? Wish granted. We rolled out the ability for full access users to upload a company logo to display on your paperwork generated within Freightview. It’s super simple, and available in settings. We used to keep all of your carrier account information on the backend, but we decided the owner of the account and full access users should be able to see exactly which account number, per carrier, your locations are tied to. If you book with CHR via Freightview you will now get tracking information for those shipments right here on Freightview, just like you’re used to seeing for your other carriers. We’ve already had pallet pricing in place for a lot of your carriers, but now you can view pallet rates for R+L and New Penn in Freightview as well. If you already have these rates in place, you will automatically see them in Freightview when you run rates that are applicable. Previously, when spot quoting, we limited users to selecting 3 potential equipment types to send to your carrier contacts. We’ve removed the limitation. 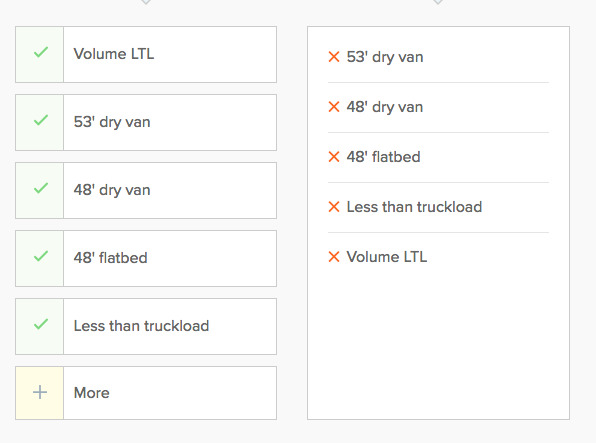 Add as many, or as little, equipment types that make sense for the load you are quoting. If you haven’t yet, leave us a review on Capterra. It’s a great way for other businesses to hear about Freightview straight from the people who use it every single day. Subscribe to the blog and never miss a new feature roll out again. Want a live look at everything that’s new? Schedule an account review with Mitch. It’s a great way to see what’s new and discuss any feedback, frustrations or suggestions you may have.